Hey, at least it’s a healthy snack. No processed junk foods here, just healthy, tasty, plant-based whole foods. 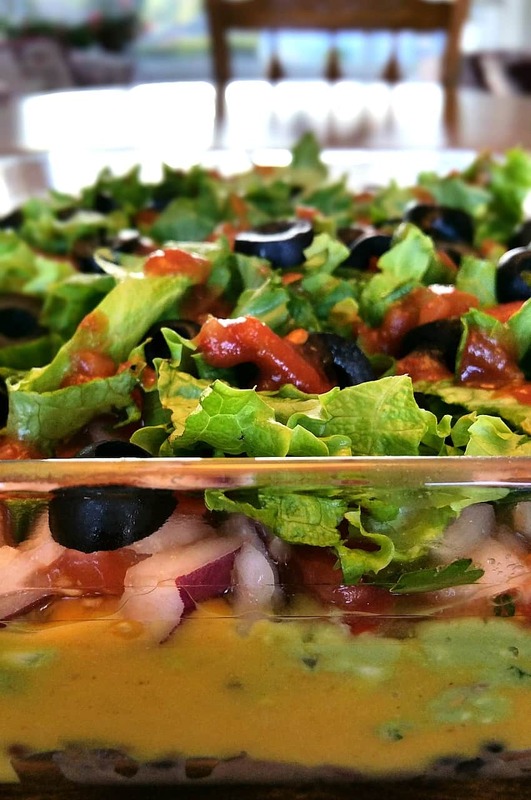 This is sure to be your favorite Mexican 7 Layer Dip (wait….1, 2, 3, 4, 5, 6, 7 – yes there’s 7 layers, whew) of all time. All fresh, plant-based, whole foods that you lovingly mix right in the comfort of your very own kitchen. And the best part of all? This is couch food. Can I get an ‘Oh Yeah’? 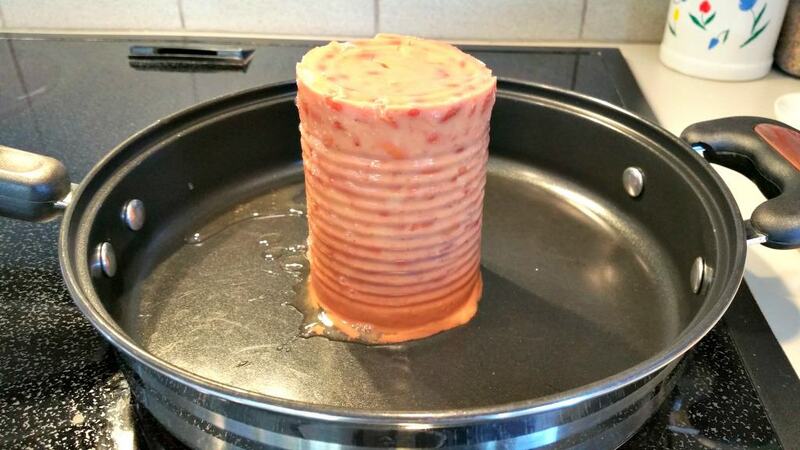 I guess you could just open a can of refried beans and smush them into a bowl. But I personally like to cook mine, for no other reason than this….. Please smash THAT up right now, and add a can of thoroughly rinsed black beans. Cook till bubbly and maybe sprinkle in 1/2 teaspoon or so of cumin and a shake or two of your favorite hot sauce. Hopefully, you’ve already got a batch of my amazing CHEESE SAUCE sitting in your fridge right now. You know, the one made from potatoes and carrots? 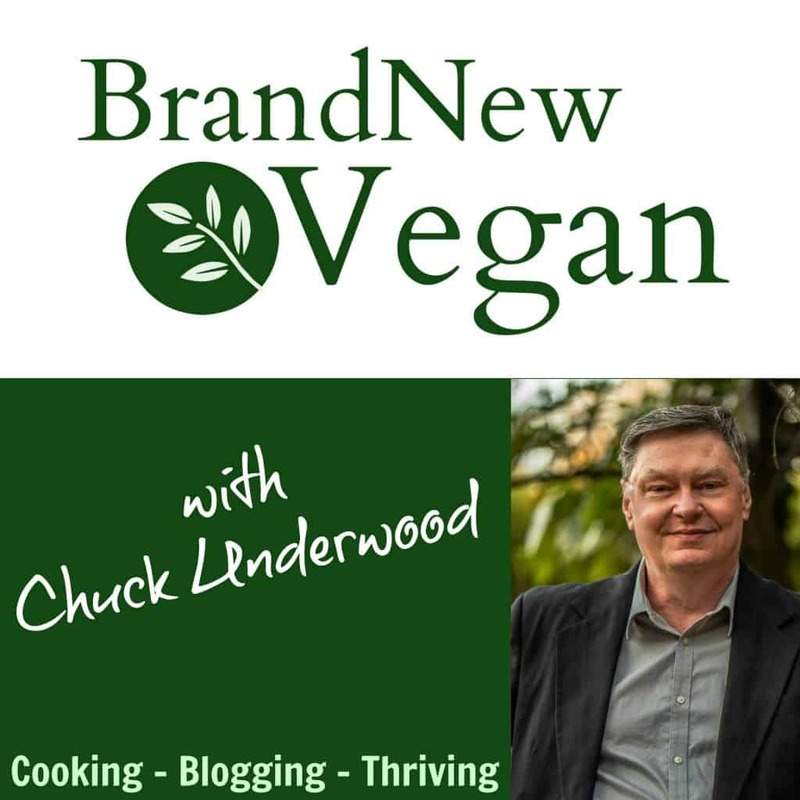 The one that is NOT made from Cashews, or Tofu? 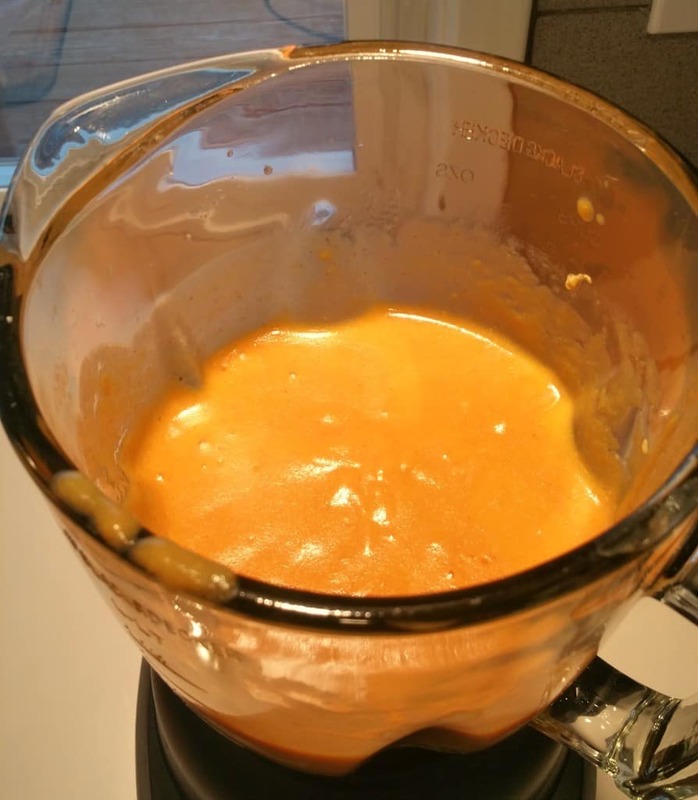 Well then stop right now, here is the recipe to my Amazing Cheese Sauce…. You’ll need a few cups of this for the dip, but the rest can be saved for later. The whole inspiration for this dip came from a trip to the grocery store. Yep, the large Avocados were on sale and after one feel, I knew they were perfect for some homemade guac. Disclaimer Time: If you’re watching your fat content, you should probably skip this layer. 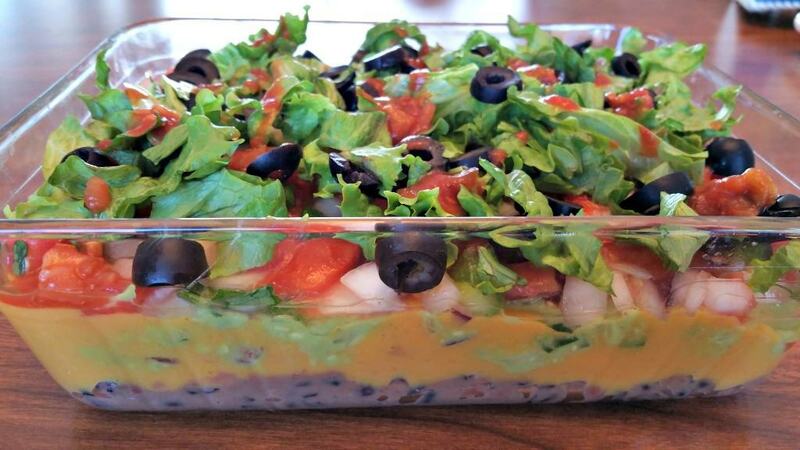 (It will be a 6 layer dip, but oh well). I know, I hear it too. “But it’s a healthy fat”. And, Dr. McDougall does allow some Avocado, if you’re a healthy, trim, person. But remember fat is fat, and the fat you eat is the fat you wear. So be careful. This IS a Vegan dish, but not necessarily a McDougall Friendly dish. And if you can’t have Avocados, well I’m sorry if I tempted you. Smash up 2 large Avocados in a bowl. Add 2-3 cloves of minced garlic, 3 or 4 chopped green onions, about 1/4 teaspoon of salt, and at least 1-2 tablespoons of lime juice with a small handful of chopped cilantro. Adjust all the seasonings to your own taste of course, but this was just about the right amount for me. Stir it up until it’s nice and creamy and set aside. Yep, that’s what it means and I have no idea how it got that name. But regardless of what this spicy salsa has to do with a rooster, we’re going to make some and it is yummy. Chop several tomatoes and add to a bowl. Add in 1/2 to 1 whole jalapeño, chopped fine. Add in about 1/2 a finely chopped, small onion, a small handful of chopped cilantro, a pinch of salt and some lime juice to taste. Stir thoroughly. That’s all Pico de Gallo is. Basically a spicy, tomato salad. This made quite a bit so I took a cup or so of this Pico de Gallo and added it to my guacamole. Now THAT’S what I’m talking’ about…..
You got this part, right? Good. Before we assemble, we should probably talk about chips. Obviously, those store-bought bags of tortilla chips are not the best thing for us. They’re usually full of oil, preservatives, and especially high in sodium. You can get around this by making your own. And it’s easy. Find some corn tortillas that have very few ingredients. Trader Joes would be a good place to look. Then simply slice them up into chip shapes and bake on a cookie sheet until crispy. Here’s a link to Mary McDougall’s Recipe for homemade tortilla chips. Now we’re ready to put this bad boy together. Layer the bottom of a baking dish with the bean mixture. I used a rubber spatula to smooth it out evenly. Now add the cheese and smooth it out evenly. You might want to wash off your spatula in between layers if you want to keep it looking pretty. Add the guacamole (if using) and smooth it out nice and flat. Don’t miss those corners! 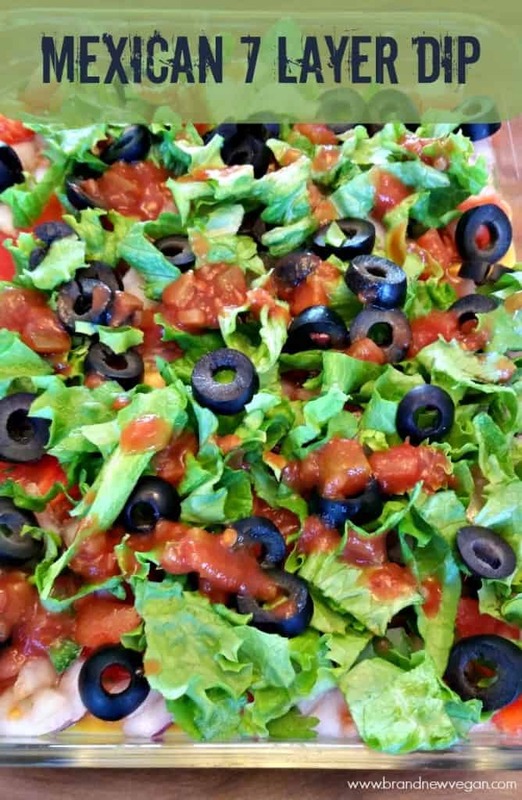 Now add the Pico de Gallo, the lettuce, black olives, and top with your favorite Salsa. Refrigerate for at least an hour to cool everything down and allow the flavors to come together. 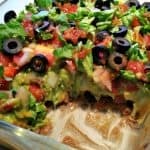 This homemade Mexican 7 Layer Dip is a mixture of fat-free refried beans, black beans, our amazing cheese sauce, homemade guacamole, fresh homemade pico de gallo, freshly shredded lettuce, sliced black olives, and topped with your favorite salsa……Dip, Scoop, Munch! 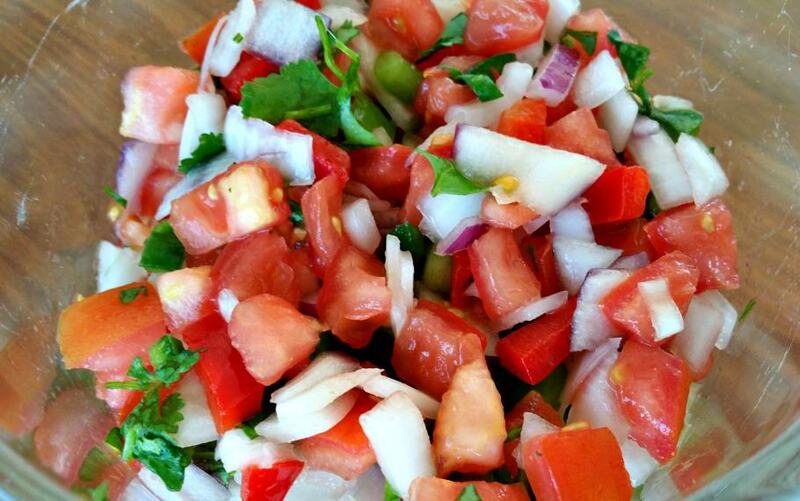 Prepare Pico de Gallo by mixing tomatoes, onion, jalapeño, lime juice, and cilantro together. Made this for a home group and everyone loved it! Thanks so much!!! Love the cheese sauce…super easy and delicious without any fat! OMG, this was sooooo good. And it’s has everything to make it a complete meal, too. I didn’t (and wouldn’t) change a thing. Thanks – I just fixed the link. Pico de Gallo is named cuz the minced tomato bits look like the beaks of Roosters…Lol I bit of a stretch but thanks for a killer recipe!! Actually, it is so named because it should be spicy enough to “peck” your tongue like a rooster would peck–but not fiery like a habanero salsa. Excellent! My family loved it. Made your vegan cheese recipe, too. Thank you! I always tweet recipes after the first try, but won’t with this one. You can make those healthy chips from healthy corn tortillas, not cut up, just baked. To store them, they fit in one of those round oatmeal boxes. When using them break them into pieces. It cuts your chip making time by a lot. I bake them at 375 F for about 17 minutes. I love this recipe. Never thought to make a layer of lettuce but it is a nice crunchy layer and adds to a tasty snack. My husband and I enjoyed this during today’s NFL playoff games. I used Mary McDougall’s pea guacamole recipe for less fat. Next time, I might drain the pico de gallo to make it a little less wet. I’m definitely taking the leftovers to work for lunch tomorrow. Really delicious and satisfying. Thanks! THIS IS THE BEST! THANK YOU CHUCK.